This post was written by Hatchet reporter Danielle Noel. The election may be over, but the KONY 2012 campaign persists. 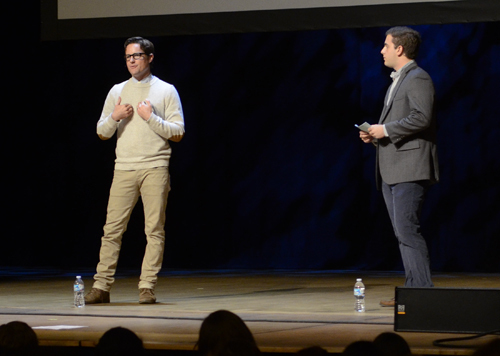 The creative director of human rights group Invisible Children Jason Russell addressed more than a hundred students about the future of the KONY 2012 movement in Lisner Auditorium on Tuesday. The movement, which garnered fame via a viral YouTube video early this year, aims to raise awareness of the Joseph Kony-led Lord’s Resistance Army in Uganda, which is known to abduct children and groom them into child soldiers. “Invisible Children has evolved because every time we show that [Invisible Children documentary], people come up and say, what can I do, how can I help,” Russell said. Russell, in a rare public appearance since his March arrest for disorderly conduct, was welcomed with great applause as he came onstage and encouraged students to remain involved. The presentation featured discussion of the organization’s successes and challenges in the wake of increased exposure and their continued advocacy human rights in Central Africa. “The most important thing that people need to know about Invisible Children right now is that we are seeing almost daily, definitely weekly, individuals in the LRA coming home because of the programs we have,” Russell said. The KONY 2012 campaign will continue Saturday at MOVE:DC, a global summit for representatives from the United Nations, the United States and countries in Africa to address solutions to the LRA’s stronghold. President of the GW Invisible Children chapter Emma Sakson expressed hope in the upcoming summit, noting that 10,000 people are expected to touch down in D.C. for the event. The group faced criticism this year when questions of funding allocations arose. They have been accused of focusing more on glitzy productions rather than actual human rights aid. Freshman Danielle Roomes approached the presentation with skepticism, but after hearing Russell speak, she felt reenergized in the mission of the organization.